When you are learning how Airbnb works for the first time, it can be overwhelming. 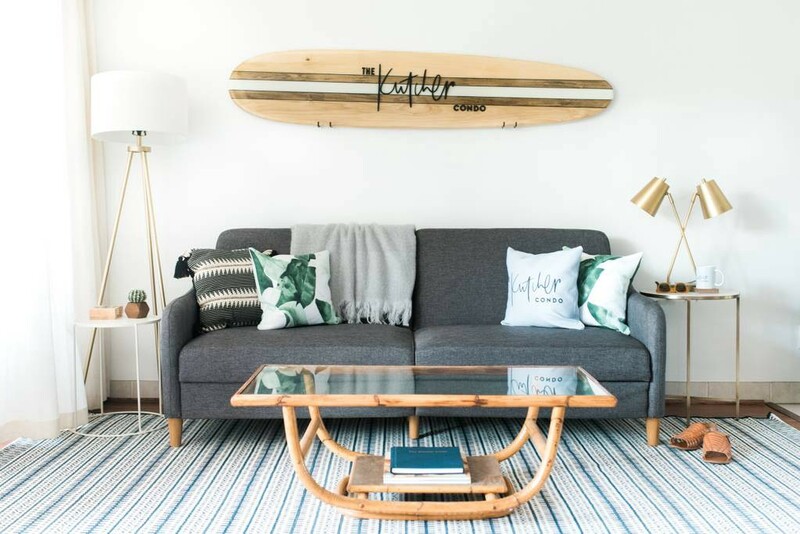 All of these Airbnb tips will help you save money, save time or make your Airbnb experience comfortable and pleasant. This is probably the most important Airbnb tip. How does Airbnb work? Really, it is the Airbnb reviews that are key to the massive growth of the platform. Real customers giving real reviews on real hosts. Reviews are the only feedback loop that potential guests have when considering staying at a particular property. Never book an Airbnb property without carefully reading each and every review. Yes, pictures and property descriptions are important, but the best way to get the real scoop about a property is to read eachAirbnb review. Reviews offer information about the Airbnb listing that the host doesn’t reveal. Naturally, the host is only going to share favorable facts and pictures about their property because they want you to stay there (duh). They may use sugar-coated words to make things sound better than they actually are. On the other hand, guest reviews will give you the lowdown and the nitty gritty. The open and honest truth. In the reviews, you might find a common issue that is mentioned multiple times. This definitely something to watch out for. And there’s no need to wonder if the reviews are legit. You must be an Airbnb user with a recent confirmed stay within the last 14 days to be able to make a review. Something to consider: Even the best Airbnb listings will have an occasional negative review. Every guest is different and has different tastes, expectations and experiences. As a general rule, if most of the reviews are positive, you can probably discount one or two negative reviews. If most people express satisfaction with their stay, you will likely also be satisfied. Read through everything (yes, everything) on the Airbnb listing page. Make sure you are okay with their house rules. Understand what amenities are or are not included (air conditioning is not always a given). Check out their cancellation policy. Do they allow pets? Do they have wi-fi available? After you have scoured the page and have read the fine print, ask the host any follow-up questions you may have. 3) Review All the Photos. Closely. Photos can provide red flags about an Airbnb vacation rental. 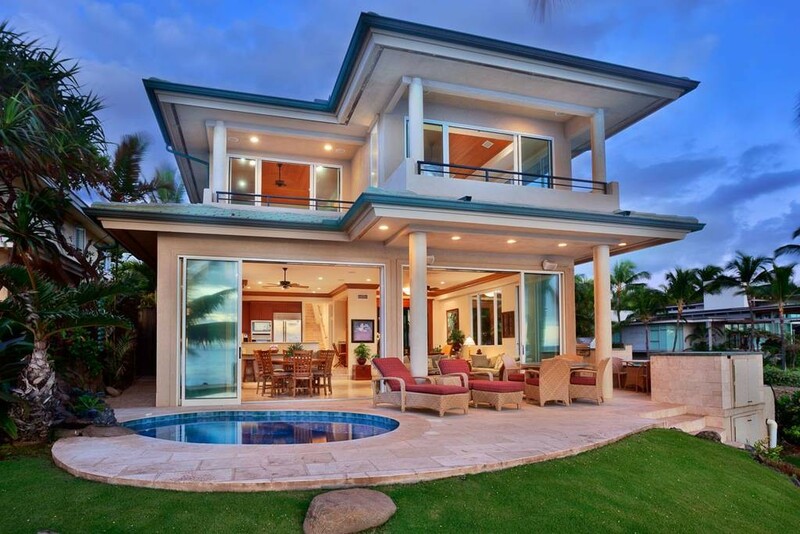 If a listing only has two photos, you should proceed with caution. If all the photos are blurry, maybe they are trying to hide something. 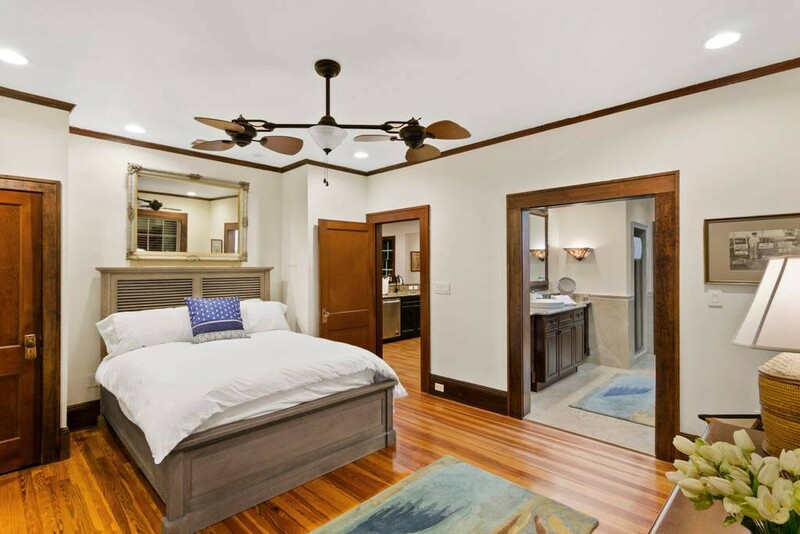 If photos of certain rooms aren’t included on the listing, then it’s something to be leery about. For example, If there isn’t a photo of the bathroom, it might be because it’s in poor condition. The best Airbnb listings showcase clear photos with many angles of the important livings spaces. We aren’t completely comfortable unless we can clearly see pictures of bedrooms, living room, kitchen, and bathrooms. There are A LOT of listings on Airbnb. There are approximately 36,000 listings just in New York City alone! To narrow the field, use the filters and search more specifically. We prefer the entire home, But if you’re wanting to save money, go for the private or shared rooms. Go to “More Filters” to narrow down the list of options even more. Maybe you want 3 bedrooms, air conditioning, or a washing machine on site. Using the filters will make the process not as overwhelming. “Instant Book” lets you book a place without being approved by the host first — it’s instant! If your listing has this feature available (not all do), you will see a lightning bolt next to the price towards the top of the page. 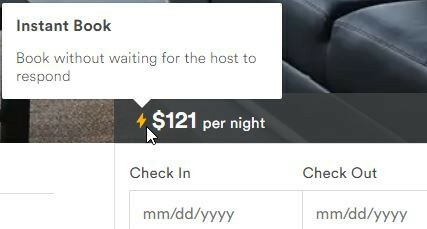 “Request to Book” requires the host to approve you and this could take up to 24 hours. 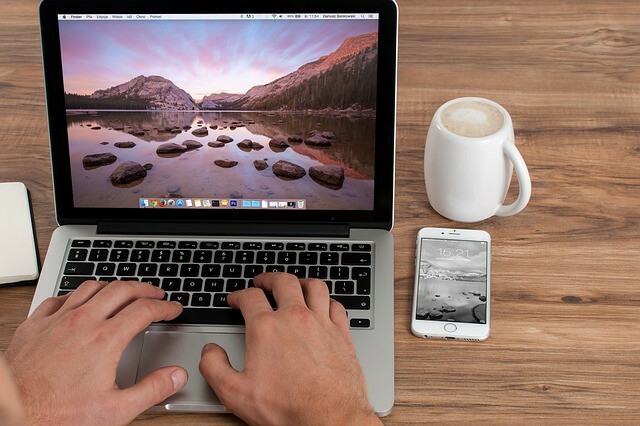 Instant Book could be beneficial if you need a place the same day you are booking or if you just want to secure your reservation so no one else snatches it from under you. If traveling foreign and you want a more authentic experience, stay with a host that is a local. You can find out if they are locals by reading each listing’s host description. Location, location, location! It’s all about location when planning where to stay on your next trip. For privacy and security reasons, when searching Airbnb for a place you are only given the general vicinity of its location — usually within a 2–3 block radius. If visiting a city/town you are unfamiliar with, go to Google Maps and check out the street view of the area of the place you are looking at. Look at the houses, shops, restaurants, etc that are nearby to see if you are comfortable with the neighborhood. You can also see approximately how long it would take to get from the area to the things you want to see. Sometimes that’s hard to tell from just looking at a map. After reading their full listing, ask any clarifying questions you may have about their place. How quickly they respond will show you how organized they are. If it takes them days to respond, that’s a red flag. A good host will respond within 24 hours, often within hours. Establish a relationship with your hosts! They are probably just as wary about you as you are about them. Communicating with them will most likely ease any concerns either of you have. 9) Watch Out for Extra Fees! If you are on a budget, you need to consider the extra fees that could be added to your reservation. To see a total for your stay, enter in the dates you are requesting and it should show you your total cost breakdown with fees included. Cleaning fee: Not all hosts charge a cleaning fee but most do to cover the cost of cleaning their space. It’s a one-time fee that is decided on by the host. If they do indeed charge a cleaning fee, it will be listed under the “Prices” section. Airbnb service fee: Airbnb charges a guest service fee for all reservations. This fee ranges from 5% to 15% of the reservation subtotal. You can see how much your fee will be by entering your dates in the calendar before you book a reservation. Guest service fees are calculated using several factors including the reservation subtotal, the length of the reservation, and characteristics of the listing. In general, higher reservation subtotals have lower guest service fee percentages. Value Added Tax (VAT): This is a tax charged to guests who purchase services in the European Union, Switzerland, Norway, Iceland, South Africa, Russia, Serbia, Taiwan, the Bahamas, Albania, China, Japan (charged as JCT), and Australia and New Zealand (charged as GST). This tax is added into the Service Fee. Local taxes: This is charged based on the location of the host’s listing. Not all reservations will require this tax. Some hosts include this tax in the price of the reservation, but some may require the tax to be paid upon check-in. If this tax is applicable to your reservation it should be listed in the description. At many Airbnb properties, your vacation rental price increases based on how many people are staying with you. 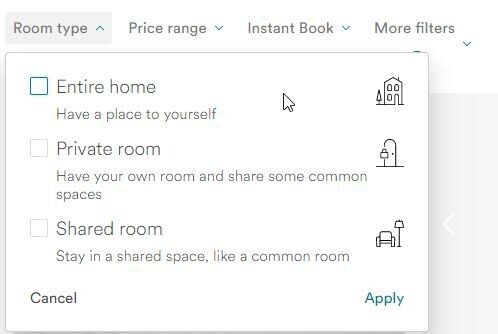 For example, at the top of the listing Airbnb states the place can accommodate 6 people, but if you scroll down to “Prices” you see that there is a $25 charge per person for more than 4 guests. This increases the nightly price dramatically so make sure you take that into consideration. When doing your initial searches, enter the number of guests that will be staying with you to give you the best reflection of the true price of your stay. Are you interested in a new Airbnb house but it has no reviews? 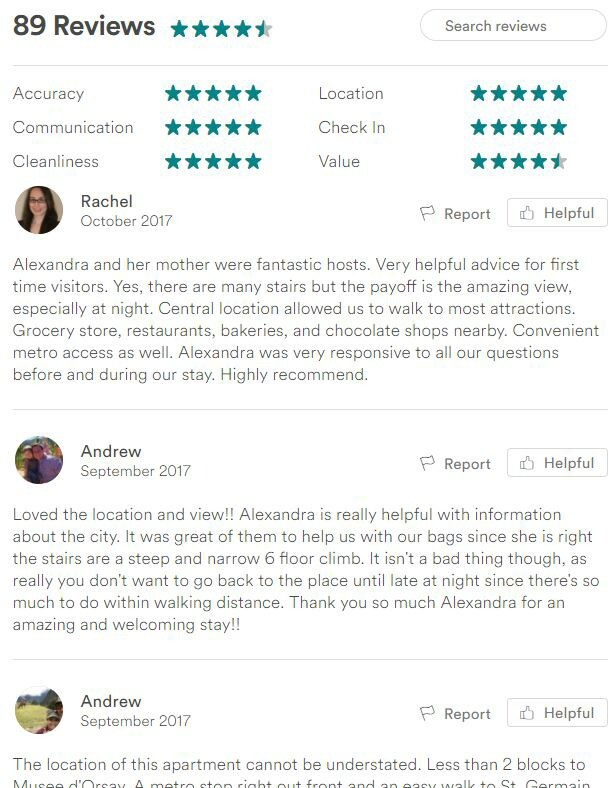 Check with the host to see if she has other Airbnb rentals that have reviews. If guests are raving about the host’s other Airbnb properties, chances are the new listing will be just as good. 12) What are the Host’s Interests? Take the time to read the profiles of your potential host and learn about their personal interests. While there are no guarantees, you might find that hosts who love to read have plenty of books waiting for you. Or a host that enjoys cooking, for example, might have a better stocked kitchen than other potential hosts. There are a lot of properties to choose from on Airbnb. A major time-saving feature for us is the Wish List. When you come across a property that you want to remember, simply press the “Save” button and it will add the listing to your Wish List. Later, when you are ready to narrow down your search, you can easily come back to your Wish List and see all your favorites. 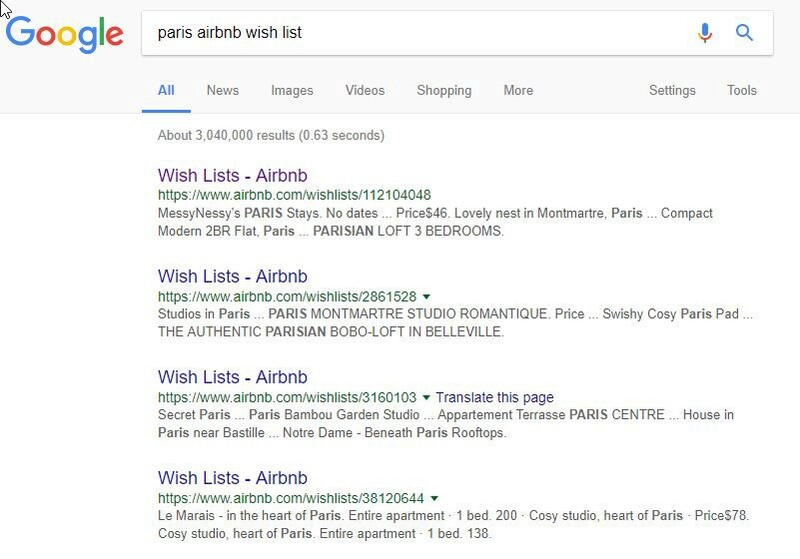 Did you know you can use Google to find the Wish Lists of other travelers? While your mileage may vary on this, this can be a time-saver to see the properties that other travelers already saved. You can get free $40 toward your first stay. Let’s hear it for free money! Know EXACTLY where you want to stay? If you have your heart set on a specific property, you need plan ahead as far in advance as possible. Remember — Airbnb properties aren’t like hotel rooms where they have a variety of the same room available to book. The popular places book out fast! So plan ahead and be flexible. The further out you book your stay, the more options you will have. The same is true if you want to try staying in sought-after Airbnb experiences like a castle, a tree house, or a bubble. When you click Request to Book that sends a notice to the Airbnb host. When the host accepts your request, you will be charged at that time. So, only Request to Book when you are sure about your dates and you are 100% ready to stay there. Save yourself a ton of hassle and pay only using Airbnb’s website. Airbnb has a secure payment system on their website. While it might seem tempting to pay with cash or some other alternative method to avoid Airbnb’s service fees, you will lose protection from the company should anything go wrong with your stay. If a host asks you to pay outside the system, you might want to reconsider any decision to stay with them, as it should cause you to question their motives. Under extenuating circumstances (something more severe than simply changing your mind), you may be able to obtain an exception to the normal Airbnb cancellation policy. Sometimes life happens and trips get cancelled. In tough cases, you can contact the host directly to see if they are willing to refund your money. If the host is unwilling to help you, you can often get help by contacting Airbnb depending on the circumstances. When it is time to get serious about booking your first Airbnb rental, it’s important that you have created an Airbnb profile and verified it. 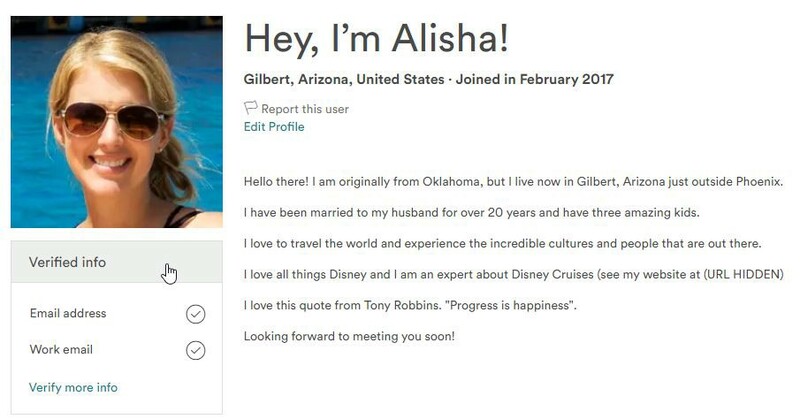 Building trust with your prospective host is important and it starts with your Airbnb profile. Select a good profile picture of yourself that is in focus, looks great, and paints you in a good light. You also have the option to upload a short video of yourself — this is definitely a good idea. Hosts will absolutely look at your profile to make a decision whether or not to rent their house to you. Some Airbnbs don’t provide any toiletries so bring your own shampoo, soap and other bathroom essentials. No need to bring bath towels though; towels should be provided. It is important to have good communication with your host so that you can work out how to get access to your Airbnb. You will most likely need to meet your host so you can pick up or drop off they keys. Sometimes you are meeting a property owner that needs to coordinate his schedule to meet you. Or your rental might be managed by a property manager who requires you to visit a separate location to pick up the keys. Make sure to plan this out before you arrive so you are not stuck waiting around. Want to know where the best restaurants are in town? Or where to go snorkeling? Hosts are usually local residents of the area you’re visiting and can be a tremendously valuable source of great advice and local information. You will be responsible for your own housekeeping. This is probably a non-issue if you are just staying a couple of nights, but if you are staying longer you may need to wash towels, sheets or even clothes. It may be a good idea to rent a space with a washer and dryer or at least have a laundromat nearby. Did you know that Airbnb guests receive a review just like the hosts? Hosts use these reviews to determine to whom they are willing to rent their home. If you get a bad review from a host, it may be hard for you to book with Airbnb in the future. Make sure to read through the house rules before you arrive since they vary from host to host. Yes, being considerate and polite is always a good idea. Getting good reviews is in your best interest to obtain future Airbnb bookings. When travelling in a foreign country, ask your host if the local water is safe to drink. If you are unhappy with something or something is not working, tell your host as soon as possible. Let them try and fix it for you. Most will do their best to make it right. Don’t keep quiet during your stay and then rant about it in your post-stay review. Hosts want you to be happy and satisfied with your stay — it’s important for their business. Once you book a reservation, your credit card will be charged by Airbnb. Airbnb will hold on to your money and will not release it to the host until 24 hours after you check in. This way, if there is a problem, refunds on Airbnb can be done easily since the money hasn’t been transferred yet. If there is a problem, always notify the host first. If they cannot (or won’t) fix the issue contact Airbnb within the first 24 hours of your stay, and they will put a hold on the payment. Always take photos to support your claim. The host fails to provide reasonable access to the booked listing. The listing booked is misrepresented (ex: number of bedrooms, location, lacks promised amenities). The listing isn’t generally clean, is unsafe, or there’s an animal in the listing that wasn’t disclosed prior to booking. You will either receive a full Airbnb refund or be placed into another comparable Airbnb property. After your stay, always leave a review on Airbnb. The Airbnb community relies on reviews to help future travelers pick their next stay. Was it exactly as it was described? Was the host easily accessible when needed? Just remember you only have 14 days after checkout to write a review for a trip. One area is that can be confusing to first-time guests is how the Airbnb security deposit is handled. So, how does Airbnb security deposit work? The good news is that you don’t have to pay the Airbnb deposit at the time of the reservation. In fact, the security deposit Airbnb lists on the rental listing is not collected automatically. In many cases, the deposit is never charged at all. Your Host has 14 days after you checkout (or before a new guest arrives, whichever is first) to make a claim about damage to their property. They go through the Air bnb Resolution Center to request money. This is where the Airbnb security deposit comes in. As the guest, you’ll have the chance to “accept” the security deposit Airbnb is requesting on behalf of the host. If you’re a newbie to Airbnb, follow these tips above to have a safer, more enjoyable, and probably cheaper vacation experience.